If it’s true that “time flies when you’re having fun” then we’re all in trouble. The ultimate pursuit of our day is a peaceful existence. One of balance and even, yes, fun. 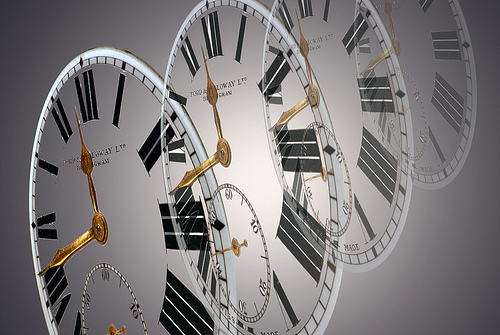 Why should time appear to be so fleeting? The answer is simple: we don’t step into the awareness of our time. By this it is meant our time as a whole. This is especially true in our lives outside of work, the part of life that is not regimented by meetings and deadlines and time-clocks. In our home lives we are free to waste time just as we are free to value time. Your day is just what it is: 24 hours. You have the ultimate responsibility to plan exactly how you will spend these hours, and you will do it according to what is of value to you. Sleep is a priority for most, so check off 8 hours. Getting dressed, eating meals are two other imperatives that take another 2 hours of your day. If work consumes 8 hours, you’re left with around six hours most days to make choices. Six hours are yours. Think right now what choices you’ve made for your six hours today. Individuals often set unrealistic expectations for what they can accomplish each day. If you believe there’s not enough time for you to live and complete all the tasks relevant to your life, then you have one of two issues. One, you set out to do too many things, or two, you didn’t manage your time effectively. Perhaps you have both. Plan your time conservatively and set reasonable objectives for your day. Better time management is our ultimate responsibility. Time will pass and your productivity is measured by what you’ve accomplished in any specific, measureable period. This is where living a life with goals in your home and personal life is crucial. Make your goals specific and measureable, regardless of whether you want to spend more time with your kids or clean out your garage. You have the time to make it happen, make it a concrete reality by writing it into your day planner today. Time management is often mistaken for a skill, a practice at which you become proficient. On the contrary, it is more a choice you can make each day for a better way of life. Make it start at home. Tell us your thoughts. Do you have time management tips that lead to better balance in your life? Please comment. ← Will You Buy the New iPhone? Thank you for the comment maritzavdh. You are so right that by creating structure in your family life you will enjoy more peaceful, productive time. Couldn’t agree more! That’s why I decided to take control of our lives by getting our family’s chaotic lifestyle under control using a combination of techniques, such as GTD, Personal Kanban and simple checklists. Not only are we getting things done, but we’re calmer and happier. And there’s more time for each other.